Empty Box Theatre Company‘s A Young Lady’s Guide To Vivisection is playing at the Toronto Fringe Festival. It is an important story about a chapter in the social, political, medical and feminist history of Canada. In 1882, Elizabeth Smith, Alice and Bessie are the first three women to be enrolled in Queens University’s medical program and they face a myriad of challenges posed by their classmates, their professor, the institution and they confront societal expectations of what a proper woman should be. 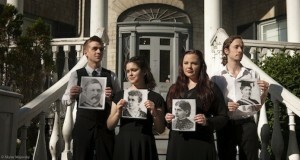 The play follows the women’s first three months in medical school and their struggle to be taken seriously. Parallel to this is their professor’s struggle to convince the Faculty of Medicine that the more radical and revolutionary ideas of Louis Pasteur and Joseph Lister should be introduced into the school’s curriculum. The performance uses various storytelling techniques. Historical and biographical facts are interspersed and provide insight into the past, present and future of each of the characters’ lives. There are also interludes that present a problem and a solution. For example, a man has difficulty putting his shoe on and uses a shoehorn to aid the process. “Progress!” he declares. I felt these breaks were too much of a distraction from the actual story and could have been crafted more skillfully. The writing adheres to a Victorian sensibility and decorum. There’s just the right amount of medical speak not to overwhelm us and the prevailing thoughts and beliefs of the day are well articulated. I felt the sexism expressed by all the characters was too on the nose and could use more subtlety and refinement. The set is simple and well managed. A table on wheels serves as a desk and an operating table and two small benches are carried on and off to create a lecture hall, courtyard and waiting area. Two surgical screens stand on either side of the stage behind which objects and actors cast shadows to accentuate various scenes including medical examinations, surgery and cadaver hunting. Lighting was used to great effect in this way as well especially for the narration breaks. The costumes were great. Each actor was decked out in either a long skirt, fitted waistcoat, tails, top hat or every combination therewith. After the show, I overheard two audience members talking about how cute the female characters’ trousers were and how they wanted a pair just like them. Classics never go out of style. I felt the acting could use more depth and variation. Samantha Wymes’s Elizabeth Smith hits fever pitch while she attempts to dig up a corpse. The actor shines as we catch glimpses of her character’s blind ambition to be a doctor but the truth of the moment is not sustained throughout. It would be great to see more of the internal struggle of Jonathan Phillips’ Dr. Fenwick, his reluctance to teach women, his drive to revolutionize the medical profession and his disappointment with institutional nay saying. I feel that the emotional stakes for everyone could be much higher than they are. I definitely liked that two of the actors swapped gender for the play. It doesn’t always work but Alex Olley as the feckless and womanizing Baker and Robert Elliot as the prudish and self-assured Bessie pull it off well. Overall, A Young Lady’s Guide To Vivisection is a play that ought to tour the country. It stands as a testament to how far we’ve come in terms of how we view women’s roles in society as well as how far we have left to go. While I did enjoy it, I thought some of it could be trimmed. Leaning more on the educational than purely entertaining. I liked how the props and lit panels were used to illustrate the story without having to clutter the stage.